CHINA-VATICAN Dear Vatican, what should we do about the Patriotic Association? Dear Vatican, what should we do about the Patriotic Association? Savio, a priest of the underground Church, writes of his difficulties of conscience in accepting bishops who are involved with the Patriotic Association, because they support an "independent Church", incompatible with Catholic doctrine. For the priest there is an unresolved ambiguity in the Vatican's behavior. And he asks for help and for coherence. Rome (AsiaNews) - We received and decided to publish this "open letter" from a priest of the underground Church in China, whom we will refer to under the pseudonym of Savio. It is an example of the difficulties and problems of conscience that many unofficial priests are experiencing. Yesterday we published the reflection of an underground priest of Mindong - which Fr. Savio cites - who, together with his Bishop Guo Xijin, resolved the matter, with obedience to the new Bishop Zhan Silu. But the problem remains: beyond government recognition, is it possible to lightly adhere to the Patriotic Association and support an "independent" Church? Fr. Savio asks for clarity from the Vatican. 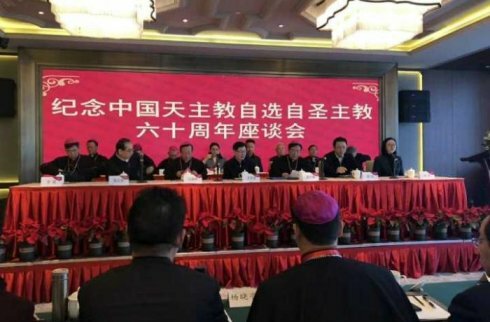 After the recent signing of the Sino-Vatican Agreement, the difficult problem of where to place the seven bishops who have recently been legitimized remains to be resolved: they must become the ordinary bishops of their diocese, so the original bishops must resign and retire or step aside to make room for them. In the past it has always been considered that the legitimacy of illicit bishops was not a problem, since with episcopal ordination they became bishops even if illegitimate: the ordination was valid even if they could not exercise episcopal ministry. The problem is where they are placed after legitimization, since the diocese already has an ordinary bishop ... according to official documents, it seems that the Holy See has solved this problem on paper. But they are facing new problems and more serious problems, which perhaps they do not want to face or avoid discussing, putting us in front of a serious and painful choice: to accept or not the Patriotic Association? Conscience and obedience are now in opposition. On the one hand, the Letter of Pope Benedict XVI to the Chinese Church is still valid, and clearly states that the principles of the Patriotic Association cannot be reconciled with the doctrine of the Catholic Church (see No. 7 of the Letter of Benedict XVI). On the other hand, bishops belonging to the National Patriotic Association can replace bishops who have been persecuted for not having joined the Patriotic Association in matters of faith and truth: this places clergy and the faithful in a contradictory dilemma, the very people who from the beginning have been faithful to the doctrine of the Church. Vatican, please tell us what to do? Owing to obedience, must we voluntarily close our eyes, not consider the Letter of Pope Benedict XVI and pay no attention to our conscience by accepting the president of the Patriotic Association as our bishop? Or follow the principle of the supremacy of conscience and adhere to the basis of our faith, not accepting the Patriotic Association and its Bishops? One must speak of obedience, because the official documents of the Vatican clearly state that a patriotic bishop replaces the ordinary. Msgr. Guo Xijin of the Diocese of Mindong and all priests in obedience are without guilt, unconditional obedience, in accepting a Bishop nominated by the Patriotic Association: the "loyalty of the Diocese of Mindong" is like drinking a sip of tea. The term "fidelity" means loyalty to a superior authority, being faithful to the tradition of the Church, faithful to the representative of Christ on earth. When we chose to follow the line of "clandestinity", it was because the Holy See did not recognize the official bishops, for which we had refused communion in the administration of their sacraments. Now we accept the official Bishops as our Bishops, for the same command of the Holy See, so the rejection of then and the acceptance of today are of the same nature. But what is not remembered, is that the prohibition of the Holy See at that time was because of the Patriotic Association and the choice to go underground was because of the non-reconciliation of the same Association with the doctrine of the Church: Does this indicate that the problem of the Patriotic Association has been solved ? If it is not solved, is not it a contradiction? Should we still consider Pope Benedict's Letter an instruction from the Holy See? Should our obedience be carried out with our eyes closed? Conscience tells us that the Letter of Pope Benedict is still valid and Pope Francis has emphasized its validity. This is why the dilemma arises: since the Patriotic Association and the Church's doctrine cannot be reconciled, how can we accept the president of the association as our bishop? In line with the previous Pope's Letter, I cannot accept a patriotic bishop as my bishop, unless he leaves the Association. If you ask me to accept a patriotic bishop as my bishop, I can only neglect and forget the Pope's Letter which is still valid, unless it is clearly said that it is no longer valid. In this dilemma, leave me the freedom of choice: I cannot open one eye and close the other, I do not want to disobey, but not even betray my conscience: I can always go home and return to cultivating the fields. I am an ordinary priest, I do not have the intellect of these great people who think so much; I have a simple faith that is based on yes is yes, no is no; I have no ambition for power, nor am I ambitious: in the contrast or contradiction between faith and obedience, between conscience and obedience, please, dear Vatican tells us: what should we do?